This page points to resources you can use and describes activities that I run when I make an author appearance. Here’s a record of a webinar I led, showing educators how to use Grandmother Fish, Clades, and Clades Prehistoric in classrooms. It’s hosted by the Teacher Institute for Evolutionary Science. This webinar refers to several of the activities described below. Here are links to five images, one of each Grandmother, formatted to fit on letter-size paper. A teacher asked about using images of the Grandmothers in class, so Karen created these. I’ll be using them, too. 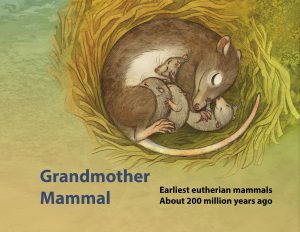 They include notes on the animals that each Grandmothers lived and how long ago those animals lived. Five Grandmother images. Help kids get a sense for how long ago the “Grandmothers” lived by telling them how long it would take to say their names, with all the “greats” included. There have been 200 million generations since Grandmother Fish. How long would it take to say her name with all 200 million greats? Find out. Grandmothers and Deep Time. Have five kids represent the five Grandmothers, and have them space themselves on a line out relative to how long ago each. Then expand the timeline from 400 million years step-by-step until to 14 billion years and watch the kids crowd into the last 1/30 of the timeline. Link to timeline figures. 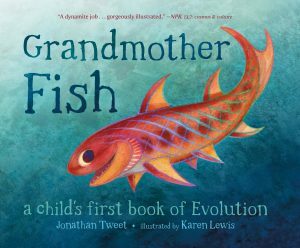 These notes show how you can use the “Grandmothers” in Grandmother Fish to start conversations with young people about evolution. A lot of thought went into choosing the two actions for each Grandmother, and these questions kids see how these actions fit into our evolutionary history. Link to questions. 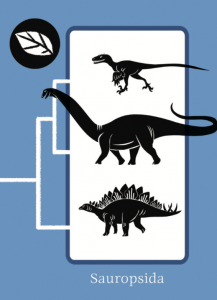 The Clades game features eleven clades: three each among mammals, sauropsids, and arthropods, plus ray-finned fish and mollusks. Here’s a question for each one to get kids thinking about the evolutionary history of these clades. Evolutionary questions for Clades. The Clades game includes science notes on all eleven clades featured in the game. These posts are early drafts of these notes, usually longer than the final and with different information. Clades science notes. This lively song is sung to the tune of the Hokey Pokey, and it’s all about how our limbs and bodies are derived from the limbs and bodies of our fishy ancestors. Link to lyrics. My curated list of books, online resources, and other good things for adults who want to help kids learn about evolution. Link to list. Often I read Grandmother Fish to some group or class, and sometimes I do a lot more than read the book. For me, the book is just a starting point. Here’s an outline of the activities that I’ve run. To contact me about putting on a program, use the contact form. Thanks. Reading Grandmother Fish to a group. Interactive format is fun for all ages. How long would it take to say the 200 million greats in Great-Grandmother Fish’s name? Deep-time timeline on the floor. Starts with five “Grandmothers” over the last 400 million years. Identifies extinctions, 252 and 66 million years ago. Rescale timeline to be age of life on Earth, the age of Earth itself, and finally the age of the universe, 14 billion years. Answer questions about the book or anything evolution related. Relate what kids saw in the book to what they already know: pets, dinosaurs, birds, cavemen, fossils, or whatever. Kids often also ask about how I wrote the book and got it published. Cards games that teach basic concepts of evolutionary relationships and taxonomy. Great for a public space because you can drop in and out, and there’s no waiting for your turn. Vocabulary: clade, sauropsid, arthropod, mammal. Also: the evolution game Go Extinct! by Ariel Marcy. Evolution quiz games enabled with a free app. Any number can play, kids to adult. Designed to address big ideas. Accompanied by explanation and context to reinforce the big ideas. Like the Hokey Pokey, but about how the parts of our bodies are derived parts of fish bodies. Engages kinesthetic learning, reinforced by rhythm and repetition. Also: “If You’re Disgusted and You Know it Go Blech” (song). Also: “Five Violet Spiders,” an animated nursery rhyme by Tania Lombrozo. “Males” and “females” are randomly assigned “fitness” values, and then sort themselves out according to different mating patterns. Designed for adults but not graphic. People vote with their feet to voice their opinions on topics of evolution, such food, pets, genes, mating, gene editing, cloning, or whatever topics suit the audience. Discussion on each topic occurs after voting and doesn’t last long enough to bog down. Everyone voices their own opinion by where they stand so no one gets shut out of the conversation. Great icebreaker or stand-alone experience. When Mitochondrial Eve was alive, she was not the only woman. Y-Chromosome Adam was not the only man of his time. How can that be? This interactive activity has kids act it out. “The Sea” by Mary Oliver. “All In” by Tiffany Taylor, in the book Great Adaptations. 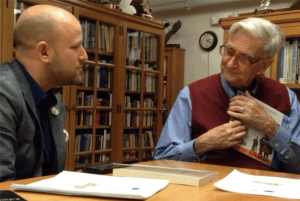 E. O . Wilson hugging my book. Inspired by my young daughter. Took 15 years to get right. Found the perfect artist to work with. Raised money on Kickstarter. Self-published, sold out, and signed with Macmillan. Endorsements from personal heroes of mine, and great reviews by experts. Dream come true.